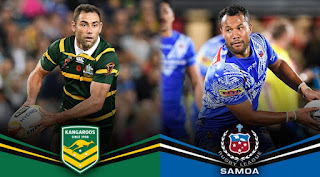 Toa Samoa forward, Sam Tagataese, says the success of Pacific nation teams gives his side extra confidence as they prepare for battle with Australia in a must-win clash at Darwin Stadium this Friday. It will be an uphill battle for the Samoans, who are still yet to win a game in this year’s tournament and will have to play a full-strength Australian side which has conceded only 10 points so far. But following the success of Tonga last week, Tagataese says it shows the top tier nations aren’t invincible and they’re in with a shot. "IT GROWS CONFIDENCE AND ENCOURAGES A LOT OF THE OTHER PLAYERS AROUND AUSTRALIA AND NEW ZEALAND – PACIFIC BOYS – TO STRIVE AND PLAY FOR THEIR COUNTRIES OR THEIR PARENTS' COUNTRY OF BIRTH," SAID THE FORMER CAPTAIN. "I thought it was great that Tonga won. Hopefully they do well and hopefully we can do something special too against the Aussies on Friday." Samoa is boosted by the return of powerhouse forward and captain, Frank Pritchard, who returns to the side after missing last week’s clash against Scotland. Pritchard’s experience will be a big boost to the Samoan side who also welcome back talented halfback, Ben Roberts, who will add much-needed direction to their sizeable forward pack. Australia has selected a full-strength team for the clash after coach Mal Meninga rotated their squad during the group stages. The Kangaroos made six changes from the side that comfortably took care of Lebanon last week, with Michael Morgan getting the nod over Cameron Munster for the all-important five-eighth position. Josh McGuire retakes his spot in the starting line-up and Reagan Campbell-Gillard has won the final spot on the bench after his standout performance against Lebanon. Australia enters the match as heavy favourites and will be expecting to finish on top after the full-time siren blows on Friday. But going against them is the unfamiliarity of playing in the scorching tropical heat of Darwin. Only a handful of the Australian players have played in Darwin and with a top of 33 degrees forecast expected, the heat could be a determining factor in the game. But skipper, Cameron Smith, says his team will be well prepared for the conditions and for the match. “The conditions will definitely play a part in the final 17,” skipper Cameron Smith said. Australia plays Samoa at 7pm ACST on Friday at Darwin Stadium for a spot in the Semi-Finals.